I have a 1994 GMC S1500 4.3 I t would shut down on me I was able several times to restart with either I replaced fuel filter fuel pump i and even ran direct power to the pump with an on/off switch the truck ran about 10 miles perfect than shut down like it had before i got it restarted with either got it home shut it down and no restart unless pouring fuel in throttle body any suggestions or where to go next cant afford to keep pumping money into by guessing? Please any trouble shooting I can do? 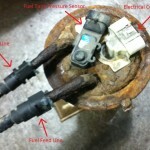 When you replaced the fuel pump, did you look closely at the connector on top of the tank? Well, it would not be a distributor or ignition problem, since you can get it to run with pouring gas in it. You need to confirm there is power to the pump when cranking. Use a test light on a good ground. If no power, then possibly a bad fuel pump relay or computer. The computer controls the fuel pump relay. Test for power and ground at the pump. As of last try was not able to start at all I did put new ground wire and tested pump is functioning however when cranking no fuel spurts from injectors. OK. Then pump is fine. Do you have spark? OK. Then ICM and pickup is fine. Use your test light on either injector connector with both unplugged to see if it will flash. If it does, then one of them is shorting out the injector driver. If no power, then you have a wiring problem from ECM to the injectors, or a bad ECM. The fuse supplies the power, the ECM grounds them. Ok Thank you I will Try what you suggested not sure what the ecm is or where it is located. I’ve replaced the fuel pump on my 93 GMC Sierra and it’s like I’m still not getting gas. Answer: We would need a little better description of the problem. Does the engine not accelerate? Does it not have power at higher speeds? Does the truck have a rough idle? Is it hard to start? Does your GMC truck start at all? Hey there, just replaced fuel pump in our 1993 Chevy TBI 350. Now have much worse mpg. Fixed pump due to in tank fuel line being cracked. Also, recently replaced fuel filter and cleaned and serviced the throttle body. With throttle body servicing put a new fuel pressure regulator in. Some other things that are going wrong are: fuel gauge in cab is incorrect, seems like we have less power than we did immediately after replacing fuel pump (drove for 100+ miles and was working great, could climb hills with ease). Seems to be a slight leaking of gas in throttle body at fuel pressure regulator, maybe due to them being over torqued? Maybe when reassembling fuel pump, only used cut out gasket alone without rtd/silicone gasket making stuff…was that enough of a gasket? ANSWER: If there is gas leaking at the throttle / fuel pressure regulator, this could be most of your problems. This will; cause bad gas mileage and lack of power because it is running too rich. For the gauge not being right, you are going to have to recheck your work of the fuel pump replacement. Either you did not hook something up right, or the sensor is bad and you did not see it. See this link and pictures about inaccurate fuel level sensors. Can I Replace The Fuel Sender Without Removing The Tank? 3 Comments on "1500 GMC Has Fuel Pressure But Won’t Start"
Had a problem with AC on my 2012 Chrysler 300 S. AC quit working so I checked relay and fuses. I found that the 10 amp fuse to ac clutch was burnt. I replaced it with another 10 amp fuse and it started working. Was going down the hwy (70 MPH) and it starts blowing hot air until we got back into town, as we begin to slow down (50 MPH) going back into town, it begins to start getting cool again but not as cold as it was. Drove in town for about five min at 35 MPH and it starts to get cold like it should. Is this an indication that the compressor is going out or could it be an electrical problem. I ask about electrical because the fuse was burnt for some reason. Have not had a problem with fuse since I replaced it. 1992 chevy truck . Tbi does not start when cold. Pour gas and it starts. Changed 2 injectors. Has a 2000 Cadillac Escalade. Crank truck , it runs for a little while and shuts back off. Crank it up aagain and it shuts off. Put fuel pressure gage; it read 0. Can hear pump running and changed out fuel filter and it was a little dirty and had a few metal flakes in the gas. and cranks the truck sometime and it runs for a little while and when i put it in gear, it shuts back off.